The Fellowes Powershred 99Ms Micro-Cut Shredder is a very high security shredder (DIN security level P-5) suitable for shredding highly sensitive, confidential and secret documents in an office or organisational setting. Shredding up to 14 sheets of 70gsm paper at a time into tiny 2 x 14mm sized micro-cut particles, this shredder shreds each sheet of A4 paper into over 2000 particles. In addition to paper, you can also shred both staples and credit cards with the machine, a real time saver if you don’t want to have to think about removing staples prior to shredding. 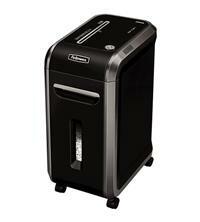 The shredder has a pull-out style bin with a large 34 litre capacity. Other features include: SafeSense technology (which stops the shredder if hands touch the paper entry); a SilentShred feature which offers ultra-quiet performance for shared workspaces (good for keeping noise to a minimum); a Sleep Mode which shuts the shredder down after 2 minutes of inactivity, castors for easy portability around the office, reverse function, 230mm throat width (for A4 shredding); a viewing window so you can see when the machine is getting full; and indicators for overheat, bin open, bin full and remove paper. Duty cycle is 20 minutes of continuous shredding followed by a 40 minute cool down period. So, if you need a heavy duty office shredder for multiple users (Fellowes recommend 3-5), consider the Fellowes Powershred 99Ms Microshred Shredder. For your peace of mind, the shredder also comes with a 2 year warranty for the machine and 5 years for the cutters.